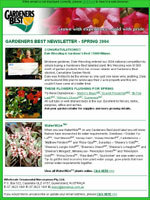 Stay in touch with Gardeners Best by joining our email mailing list. Stay in touch with Gardeners Best by joining our email mailing list. Just sign up on the form below.